On Stride, his fourth Criss Cross leader date, pianist Danny Grissett returns to the trio format he navigated with such panache and imagination on his first two outings for the label. 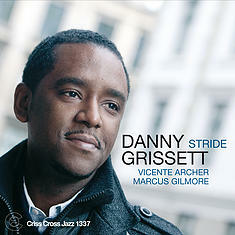 Long-time bass partner Vicente Archer and top-of-the-class drummer Marcus Gilmore join Grissett in a fluent three-way conversation on a reflective program that incorporates the American Songbook, the European canon, original tunes by trumpeters Nicholas Payton and (his current employer) Tom Harrell, and three heady Grissett originals. As always, the leader’s playing is melody-driven, harmonically acute, swinging and focused; he again proves himself one of the major voices on his instrument among the under-40 crowd.